Actors portray the beginning of the story of Matthew Shepard, a victim of a hate crime in Laramie, Wyo. The Sam Houston State University Theatre Department is going to the Kennedy Center. The department's production of "The Laramie Project" has been invited to perform at the Kennedy Center as part of the American College Theatre National Festival in Washington D.C. "The Laramie Project" is one of only four full-length productions from across the nation chosen to perform in the national festival from April 13-20. 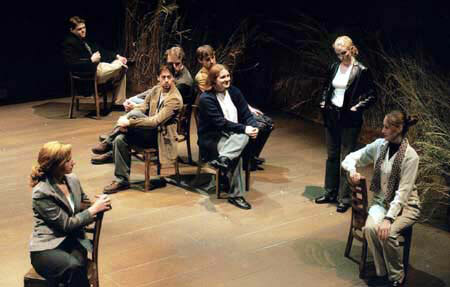 The Kennedy Center American College Theatre Festival is a nationwide program started in 1968. Colleges enter productions and individuals in a variety of theatre categories including, acting, directing, designing, playwriting, so that each may be considered for state, regional and national honors. Hundreds of college theatre departments and thousands of students participate in this yearly program, which is known as one of the most prestigious in collegiate theatre. "The Laramie Project", directed by department of theatre assistant professor Penny Hasekoester, deals with the reactions of the town of Laramie, Wyo. to the brutal beating and murder of college student Matthew Shepard in 1998. Eight performers portray over 70 different characters. The production will be staged in the Kennedy Center Theatre Lab on April 14 and April 15. SHSU will also be represented by senior theatre major David Ervin. Ervin received a Kennedy Center Fellowship in both playwriting and acting for Outstanding Achievement Demonstrated at the Regional Festivals. Ervin is one of only six students from a national pool given this honor. Ervin is also the only student to receive a Kennedy Center Fellowship in more than one discipline. Ervin's original play "Rich, Red Clay" was also selected as the runner-up to the National Student Playwriting Award and is an alternate to the national festival. "Rich, Red Clay" deals with the tumultuous relationship between Red and Clay Carter, a father and son living on the outskirts of Wichita Falls, Texas. Theatre department alumnus Patrick Pearson, who is also a SHSU staff member, directs the production. Both "The Laramie Project" and "Rich, Red Clay" have been rehearsing and performing since August 2002, and both plays have participated in a variety of levels prescribed by the Kennedy Center American College Theatre Festival. Most recently, both plays were performed at Texas Christian University in Fort Worth as part of the Region VI Festival. Region VI consists of schools from Texas, Arkansas, Louisiana, Oklahoma and New Mexico. SHSU's performance at this festival marked the first ever that the Southwest Region advanced two plays from the same school to the Regional Festival. At the Region VI Festival, "The Laramie Project" and "Rich, Red Clay" garnered multiple awards. Hasekoester won for Excellence in Directing and "The Laramie Project" won the Respondent's Choice for Best Production. The play's cast of eight; Kevin Crouch, Kregg Dailey, Haley Dyes, Chelsea Fry, Sofia Gomez, Joel McDonald, Spencer Plachy and Sarah Ripper, won an award for Excellence in Ensemble Acting. Crys McDonald also won for the Showcrafters' Award for Excellence in Stage Management. Ervin won an Excellence in Playwriting award for his show "Rich, Red Clay", and Larry Routh won the only individual award given for Excellence in Acting for his portrayal of Red Carter in the play. The SHSU Department of Theatre received commendations for both its support of playwriting and its continued work with "Rich, Red Clay." The SHSU Department of Theatre also received a commendation for Excellence in Overall Design for both productions. The designers for "The Laramie Project" are Shawn Fisher, sets; Paul Copenhaver, lights; Amber Fussell, costumes; Conner Bartley, sound and Crouch, video. The designers for "Rich Red Clay" are Pearson, sound and lights; Christie DeBacker, sets and Kira Brasel, costumes. Both productions were also advanced for consideration to perform at the Kennedy Center National Festival. Additionally, SHSU had six students and their duet partners participating in the Irene Ryan Acting Award Program. In this program, hundreds of actors in each regional level perform a duet and a monologue and are narrowed down to a final pool of 16 per region. From this final pool, two students and their duet partners are chosen to represent the region at the national festival, and two students and their duet partners are selected as alternates. The six SHSU students involved in this program were Bartley, Fry, Gomez, Joel McDonald, Plachy, and Dorcas Sowunmi. Their six duet partners were Nick Veiga, David Kenner, Jeremy Sutton, Ervin, Dyes and Sarah Brune, respectively. The pairings of Plachy and Dyes, Gomez and Sutton and Sowunmi and Brune all advanced to the final round. SHSU was one of only two schools with three or more finalists. Also, Sutton won for Best Partner in the semi-finalist round. In order to advance to the regional level, both plays participated at separate Texas festivals in October and November, where both earned a number of other awards and were both recommended to be considered for the Regional Festival. The initial pool of 65 shows from the five states was narrowed to a group of 23. These 23 productions then assembled videos and portfolios of their plays, which were all scrutinized by a panel of 13 committee members, who selected the seven shows to be performed at TCU in Fort Worth. "The Laramie Project" and "Rich, Red Clay" made it through each of these rounds of consideration. At the Texas I Festival held at Texas A&M University in October, "The Laramie Project" was selected as Director's Choice for Best Play. Also Crys McDonald won for Excellence in Stage Management and Crouch for Excellence in Video Design. Joel McDonald won for Excellence in Acting. This was also the level where Gomez, Fry and Plachy each received their Irene Ryan nominations. At the Texas III Festival held at Lamar University in Beaumont in November, "Rich Red Clay" was selected as Director's Choice for Best Play. Also, Pearson won for Excellence in Directing and Excellence in Sound Design. Ervin won for Excellence in Playwriting. This was also the level where Joel McDonald, Bartley and Sowunmi each received their Irene Ryan Nominations. The SHSU Theatre Department was also commended for Excellence in New Script Production. This is only the second year in 20 years that the SHSU Theatre Department has participated in the Kennedy Center American College Theatre National Festival. Last year, SHSU's production of "Uncle Vanya", directed by department chair Jim Miller, also advanced to the regional level in Fort Worth, and one student, Plachy, also advanced to the national level for the Irene Ryan Acting Competition.